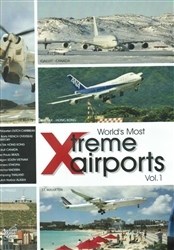 Filmed across five continents, this spectacular DVD features the dramatic checkerboard approach at Hong Kong/Kai Tak, breathtaking Caribbean landings at St. Maarten and St. Barts, extremely short runways in Thailand and Alaska as seen from the cockpit and Brazil's aircraft carrier in the city, plus we go back in time to the Vietnam War in Saigon... and much more! Join us and visit some of the world's most extreme and dangerous airports! Be prepared for Volume 2 coming soon...! !